Lytec. Tried and True with three decades of experience. Real life experience that matters when it comes to maintaining smooth billing operations. eMDs is committed to continued modernization of Lytec, adding capabilities that keep your practice up to date with industry changes. We also have the best network of committed, experienced resellers in the industry to help your practice take full advantage of all the capabilities of Lytec! Click to View Product Matrix PDF! 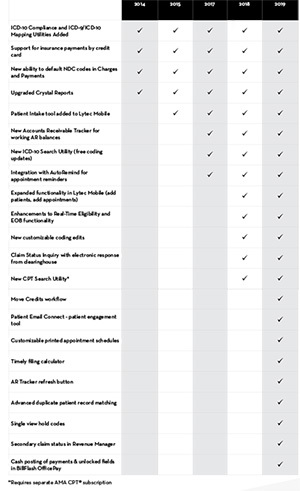 Lytec© powered by eMDs is a proven, trusted, and affordable practice management solution designed to simplify the way you run your practice. With each new release it gets better and more powerful as new layers of functionality and usability are added. Here are just a few of the notable benefits of upgrading to Lytec 2019. Mistakes happen! Great news — Lytec 2019 makes it very easy to fix payment posting errors. 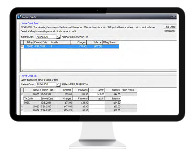 The new Move Credit workflow eliminates the manual, time-consuming double entries of the past. With just a few clicks you can choose the patient, choose the billings with the incorrect credit, move it to the billings where you need to apply the credit, and click post. This makes corrections quick, in-balance, audited, and risk free. Patient engagement and marketing are critical for clinical quality and business purposes. 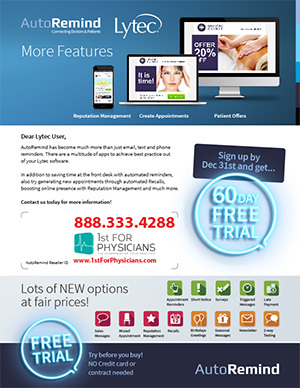 Lytec now makes it even easier to contact your patients using cost-effective email and other methods to stay in touch, provide valuable information, and even drive revenue. With Patient Email Connect included in Lytec 2019, emailing your patients is now as easy as 1-2-3. Create your lists by picking from 27 different filters such as age, gender, activity, last visit date, diagnoses, charges, or balance owed. Next, export your sorted patient list with the touch of a button. 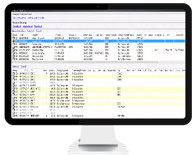 Your list is exported as a CSV file allowing you to manipulate and customize the data in your preferred spreadsheet program. Finally, import your list into your preferred email, mail or phone communication tool and send targeted communications to your patients. Use email marketing to send monthly newsletters, marketing promotions, recall campaigns, birthday messages, collection letters, patient satisfaction surveys, or solicit practice reviews. The opportunities are endless. 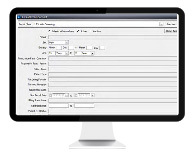 You can also use the Patient Email Connect exports to generate personalized letters, send postcards, or create call lists for phone campaigns. Need help with your campaigns? Your reseller can help you integrate with engagement platforms that take your practice to the next level. Timely filing denials are probably the most frustrating rejection a practice can receive. But since every payer operates on its own filing deadline schedule, it can be easy to miss a deadline if you’re not being careful. Not anymore! With payers and employers increasingly shifting balance responsibility to patients, practices need to know how much patients owe. More patients than ever are paying higher out-of-pocket costs for their medical care. New updates to AR Tracker’s unpaid billing transactions grid show the patient’s copay responsibility at a glance making it easier to compare against payments already made. This added perk makes it easy for billers to identify if the outstanding balance is the patient’s co-pay or if it is co-insurance remaining after insurance adjudication. Tired of starting over when making changes to a patient’s account? Now you don’t have to. The new refresh button in AR Tracker allows you to refresh your screen and see changes immediately, avoiding the hassle of re-running your AR query. With more and more patients refusing to provide Social Security Numbers, duplicate patient records are on the rise. Lytec 2019 solves this problem by going beyond comparing social security numbers and also looks at the patient’s last name and date of birth, helping you in your efforts to eliminate duplication. In Lytec 2019, you now have more flexibility when posting patient payments, no matter how they are entered. An enhancement requested by many of our users has been to permit posting of cash payments and to open previously locked fields in Lytec with the BillFlash OfficePay integration. Don’t forget you can also incorporate payment plans and credit card on file capabilities. and we'll hvae one of our team help you get started today .